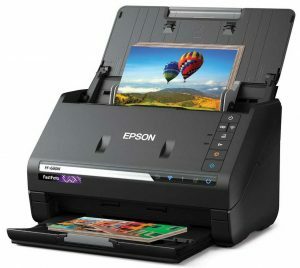 Epson Australia has launched its FastFoto FF-680W high-speed photo and document scanner in Australia with an RRP of $799. Epson characterises the FF-680W as ‘the world’s fastest personal photo scanner’. It will scan up to 36 photos per batch at 300dpi ‘as fast as’ one photo per second. Scanning at the optical limit of 600dpi will take conmsiderably longer, although Epson doesn’t provide hard data on higher resolution scanning. The FF-680W scanner handles postcards, panoramic photos up to 36 inches and Polaroid photos and the FastFoto software provides some editing, photo restoration and file organising functions. An ‘Easy Auto-Upload’ feature connects the scanner to external services such as Dropbox and Google Drive. ‘There was clearly a need for an ultra-fast and easy scanning solution that enabled people to digitise hard copy photos often stored in albums or boxes and vulnerable to many kinds of irreversible damage. The new FastFoto FF-680W not only saves these photos but also comes with a host of new features, making it easier to save and bring memories back to life using the latest digital technology,’ said Bruce Bealby, general manager, Sales & Marketing, Epson Australia Consumer Division. (This is the second generation FastFoto scanner – the original wasn’t released in Australia. The FF-680W scanner is also a powerful document scanner and enables document editing via Nuance OmniPage Optical Character Recognition (OCR) which enables users to create searchable PDFs, plus editable Word and Excel files. – Single-Step Technology — capture both the image and any handwritten notes on the back in a single scan. The Epson FastFoto FF-680W scanner is available now at $799. It comes with a one-year limited warranty.